Weddings on an island are magical. 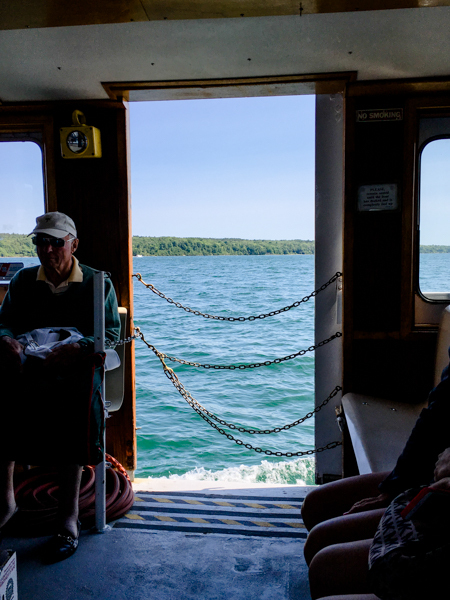 First of all there's the ferry ride which just builds the excitement and anticipation of what's to come. And then there's the "we're all in this together" vibe because you're essentially stuck on an island together. And then there's the breathtaking views and historic charm. 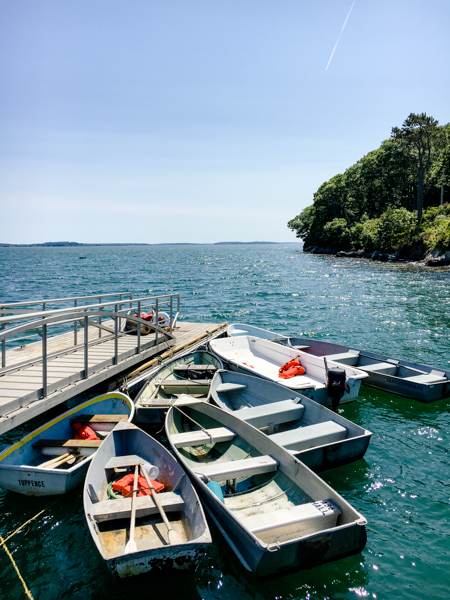 Whatever *it* is, getting married on an island in Maine truly is one of the most special and amazing adventures! Callie and Harrison chose Chebeague Island for their June wedding. On the lawn of the Chebeague Island Inn, and after almost ten years of life already together, they finally became husband and wife. I got a little choked up when they exchanged rings. The strength of the love between them was palpable. Such a happy day! Although these photos are from my iPhone, I think you can grasp the stunning beauty of their wedding day. 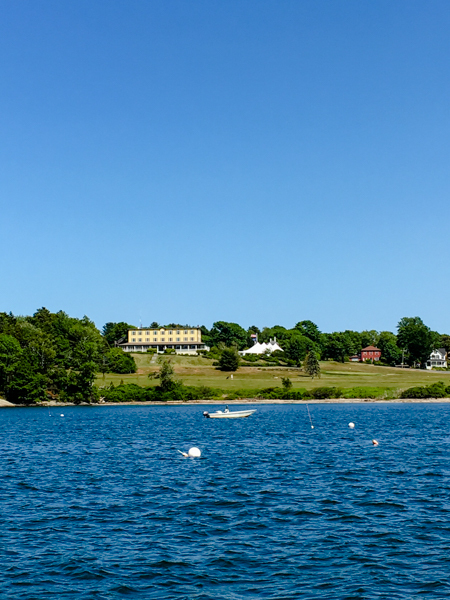 I want to say a special shout out to the staff at the Chebeague Island Inn. Caitlin, Jessica, Tina, Matt and everyone who works there treats their clients and all wedding vendors with a level of kindness and professionalism that makes you feel welcome, comfortable, confident and supported. Thank you! All photos below by me, A Sweet Start. I created a spring wedding inspiration board on Pinterest for all you lovelies thinking of getting married in the spring. Even if you're getting married at another time of year, head on over and bask in the beauty that is a spring wedding. I could stare at this board for hours. If I had the chance to do it all over again and plan (another) wedding of my dreams, I'd totally get married in May. I really love spring here in Maine: you start hearing the birds singing again, you can smell the earth thawing out, and of course the profusion of flowers inspires awe and delight! Some of my favorite flowers bloom in the spring, like lilacs, forsythia, apple blossoms, tulips and daffodils. Just that alone would be enough for me to choose this season for my wedding. So, here's what my spring wedding would look like. My wedding colors would be dreamy pastels like serenity and rose quartz, lilac grey, sweet peach, and a dash of green flash. The bridesmaids would carry May Day baskets instead of bouquets. The little baskets would overflow with seasonal flowers and have multi-colored pastel ribbons streaming from the handles. The ladies themselves would be in flowy, mismatched pastel gowns, and the ones with long hair would have ribbons in their hair. And barefeet. It was a tradition at our house that once the lilacs bloomed we could go barefoot for the rest of the summer! My centerpieces would be a mix of seasonal flowers like grape hyacinth, narcissus, ranunculus, lily of the valley and, my favorite, lilacs. There'd be lots of greens and white, too, like moss and ethically harvested birch bark. Maybe the look of the centerpieces could play off the May Day posey. 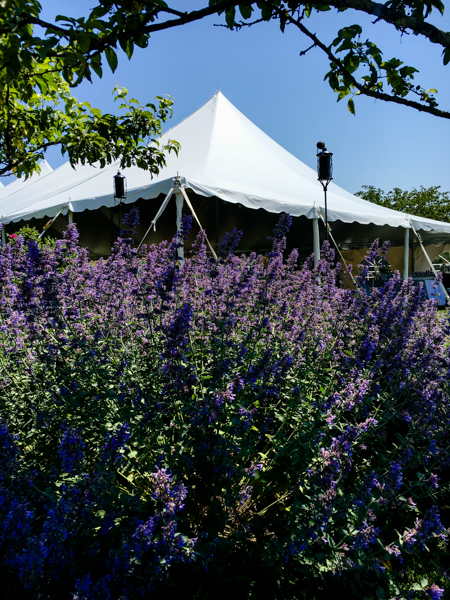 For the wedding ceremony site, I'd use an abundance of apple blossom and/or cherry blossom branches, and flowy lightweight cotton draping to decorate the wedding arch. And, of course, more of the multi-colored pastel ribbons holding the draping in place and streaming in the sunshine and fresh breeze (which of course I'll have because it's my fantasy wedding and I can have anything I want!). My wedding dress would be sweet, with long or 3/4 length sleeves and a demure neckline (think Kate Middleton). Maybe some embroidery or embellishments and definitely lots of swish. It should be simple but a statement piece at the same time. It will be a light, airy blue which is meaningful because blue is my favorite color. The place settings will have rose-colored, thin-glass wine goblets, gold utensils, a light blue charger and a pastel floral vintage salad plate on top. A mix of jade green and white milkglass salt and pepper shakers and a white cotton cheesecloth runner complete the look. This was fun! What would you add to my spring wedding inspiration? Feel free to steal the look and any others you see on the spring wedding Pinterest board. "I wondered if we could either reschedule our coffee date, or if you might want to drive to Buxton with me in the morning to cut flowers. I'll have to spend an hour or two cutting (read: working), but we could chat on the drive, and you might enjoy the flower farm." 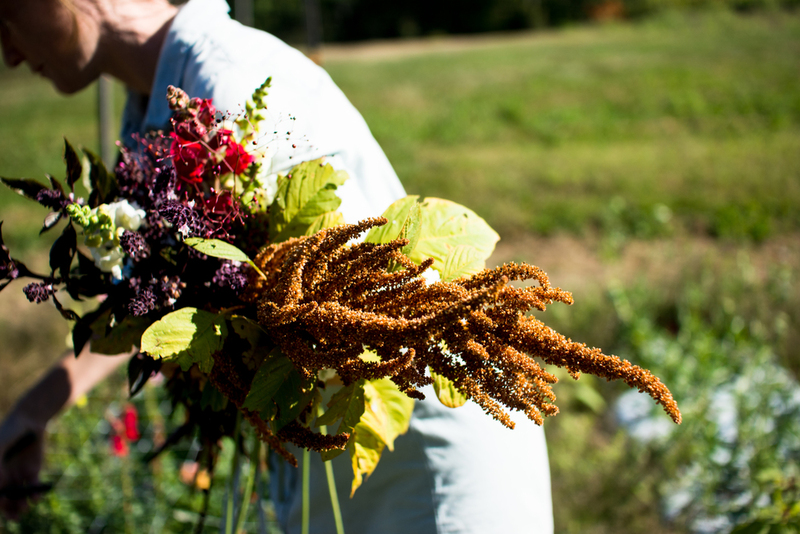 And so it was that I found myself tagging along with Megan Hevenor of Field Floral Studio to the Little River Flower Farm in Buxton, Maine on a sunny autumn day. 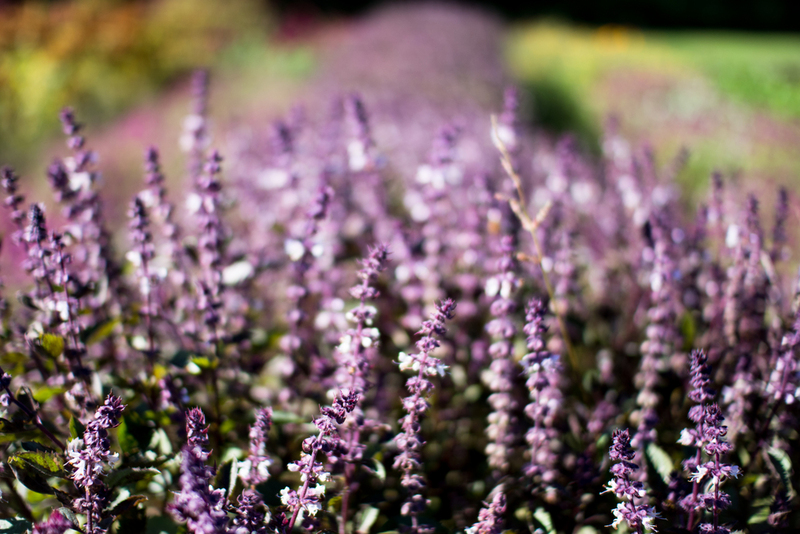 Of course I brought along my camera because: flower farm! Megan was right, I did enjoy the farm. 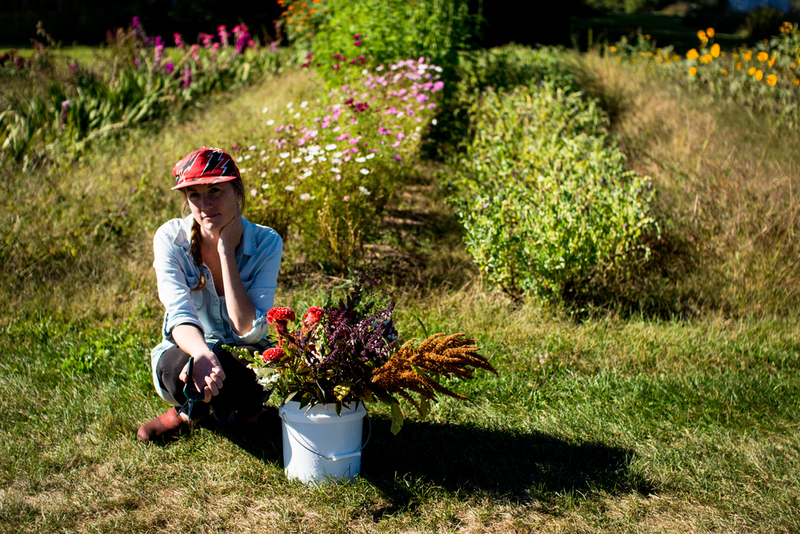 Megan is one of Maine's best floral designers. She uses her creativity and excellent design sense to create one-of-a-kind arrangements that feel natural and effortless. She's also a total sweetie and is a joy to work with! 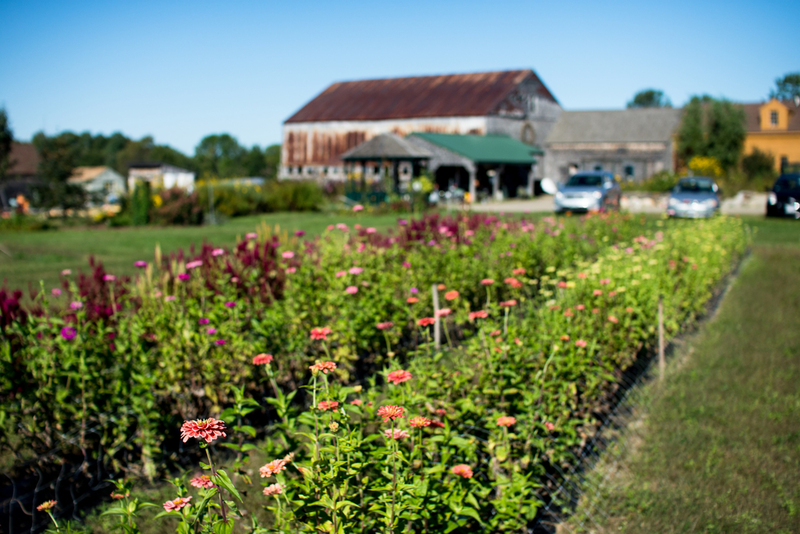 By the way, you can also get married at the Little River Flower Farm! They have a charming ceremony spot equipped with wooden benches in the forest next to a little stream. Very sweet. All photos below taken by me. I loved this wedding! Ben and Kalyn brought Jewish wedding traditions into their secular ceremony. Their fathers read the Seven Blessings; Kalyn's dad read them in Hebrew (well done, Peter!) and Ben's father read the English translation. Such a creative way to include the fathers in the ceremony. The bride and groom used local Maine beer for their "wine ceremony" and drank to the past, the present and the future of their love. They even included the breaking of the glass, a favorite tradition of mine. One of the best parts of this ceremony was that it was unplugged. Ben and Kalyn asked their guests to turn off all devices during the ceremony, which meant when we looked out at the guests all we saw were smiling faces and attentive, happy, people who were totally present. It changed the entire mood of the ceremony making it feel like everyone was truly there as witnesses and not just as observers. If I wasn't already convinced of the benefit of this concept (and I was) I am 100% on board with the trend of turning off phones and putting down cameras for the ceremony! All photos by A Sweet Start. When you start down the winding driveway onto the Marianmade Farm in Wiscasset, Maine, you feel like you've just been given a big hug. The hillside, covered in lavender bushes neatly trimmed into round humps, slopes down to the Sheepscot River. Dried lavender hangs everywhere: the barn, the bathrooms, the cottage, which means the air smells like heaven (full disclosure: lavender is my favorite scent!). I'm not exaggerating, this barn venue, tucked away along the banks of the Sheepscot River, is a special, special place. And so it was the perfect place for Karissa and John to get married! In the midst of the most gorgeous Indian summer in late September, with temps in the high 70s, Karissa, John and 12 of their dearest friends formed a band of love at the bottom of the grassy field. The barn, totally decked out in gold (!) utensils, antique bottles, and the most gorgeous flowers, welcomed their guests. I could go on and on about the perfection of the this wedding. I must say, it was the BEST way for me to bring my 2014 wedding season to a close. A big thanks and congratulations to the happy couple! Ah, late summer weddings in Maine! If the weather is good they can be epic. 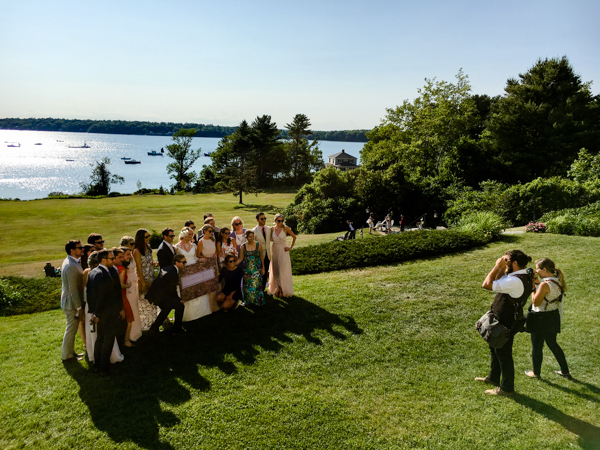 Let's just say the weather was incredibly good for Sarah and Joe's wedding at Marianmade Farm in Wiscasset, Maine. On the banks of the Sheepscot River on a lavender farm in midcoast Maine, these two clasped hands to be fasted together for eternity. What a perfect day it was! 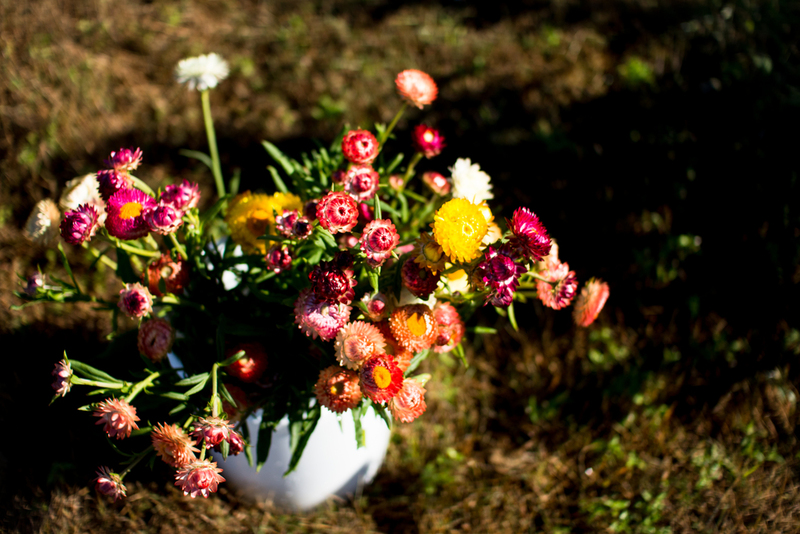 Do you have any idea how hard it is to make flower arrangements? I'm serious, have you actually tried it? And I'm talking about flower arrangements that will be used for a wedding so there's a lot of pressure to make them perfect. Well, let me tell you something. It's such hard work that I couldn't do it and talk at the same time. Now, if you know me, you know that I never can't talk! I know that's bad grammar but I'm trying to make a point here. I spent three hours making small floral centerpieces and I was wasted. I can't even imagine how Sarah, my friend over at Watershed Floral, can make stunning bouquets and tell interesting stories at the same time. But that's exactly what she does! She works with ease and joy and puts together arrangements that make people gush and dig deep into their dictionaries to find the right adjectives to describe their beauty. My camera doesn't love low light so I didn't get as many photos as I would have liked but here are a few from my visit to Watershed Floral. You can see some of Watershed Floral's recent work here and here.